This is my C64 tower. 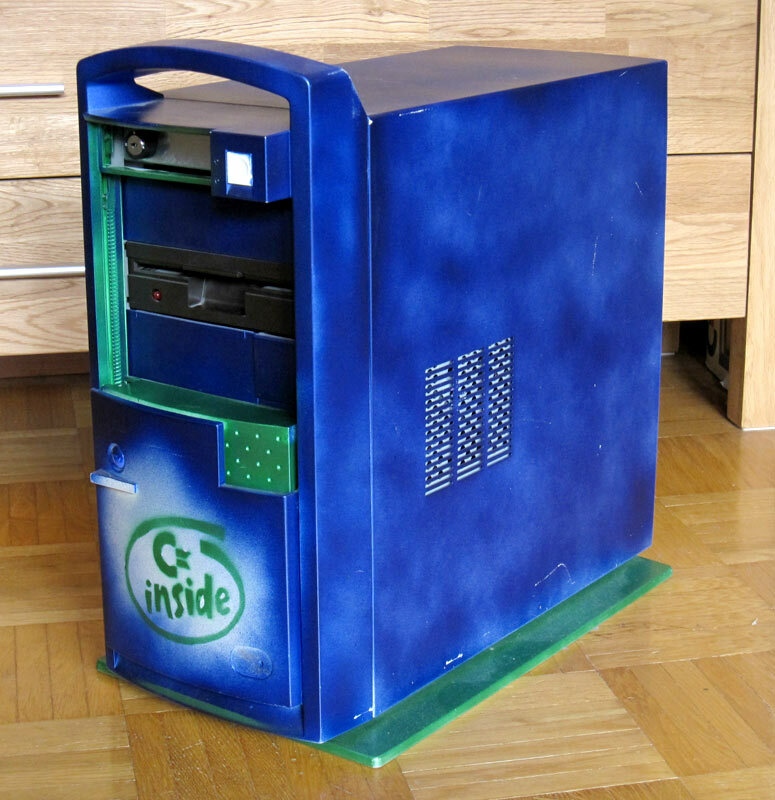 It has been built nearly 12 years ago by me and a friend of mine. It has seen it’s best days long time ago, but now I’m about to make it better than it ever was. Built into the old IBM case is a C64E motherboard (the new, short board) from a late C64 C and a much older 1541 disk drive. 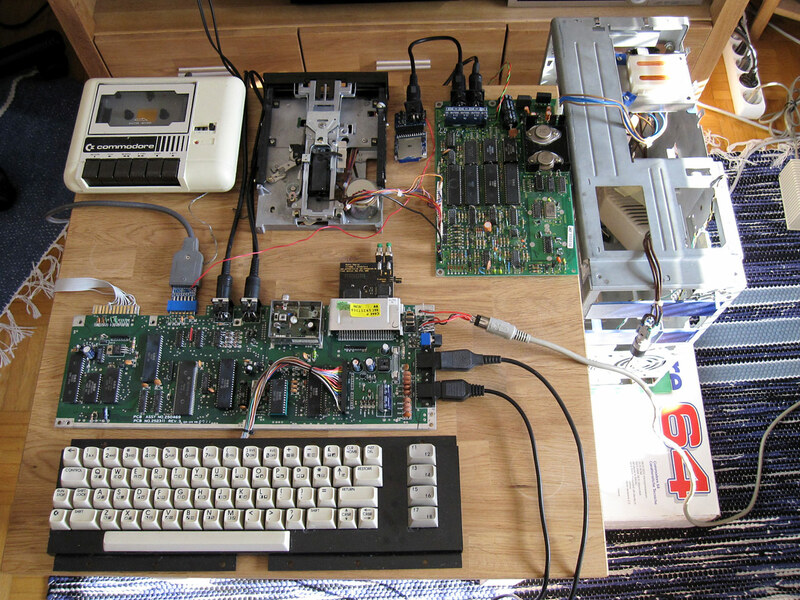 Basically the machine is an original hardware setup – including the original power supplies. The C64 motherboard is mounted horizontally at he bottom of the case. The C64 PSU is attached to the flank of the case – not very discreet I know. The drive mechanics of the bulky 1541 drive fit perfectly to one of the 5 1/4″ drive bays. The motherboard (or logic board) and transformer have been relocated around the mechanics. An external power cord plugs into the rear of the machine. The mains voltage is routed to the original transformers trough a two-stage switch and fuses. The two stage switch makes it possible to power the C64 without starting up the disk drive and also to switch off the 1541 while C64 remains on. The obvious issue of keyboard was also solved in a rather straightforward manner. The keyboard ribbon was simply cut, and then wired to the PC’s serial port connector at the back of the machine. An extension cable for the keyboard was done from old printer cable, which then plugs into the port. Not pretty but does its job! The other necessary connectors were also routed to the back of the machine. A composite video, dual mono audio and RF antenna connections were routed to the added back plate of the machine using RCA plugs. The transparent back plate is in place of the missing PC PSU. Joystick ports are available at the bottom, as the motherboard barely fits inside the case. The C64 and 1541 use the case’s power and HDD LEDs as their power LEDs. The power button of the case acts as a reset button for the C64. It was year 2000. Together with friends we were going to Assembly, and had computer places reserved – the only time I’ve had. We wanted to take something unusual with us – not only PCs. 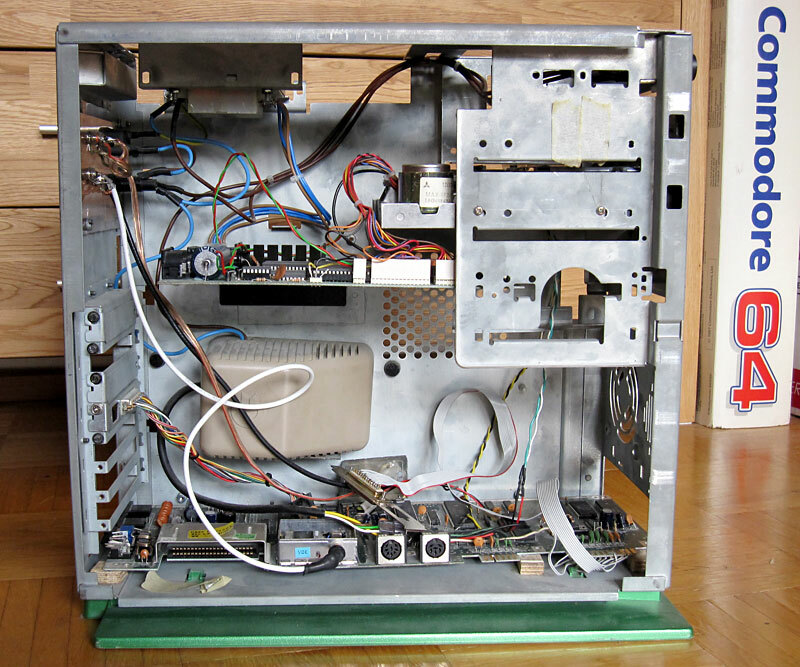 So together with a friend of mine we started to build one of my C64s into tower case. 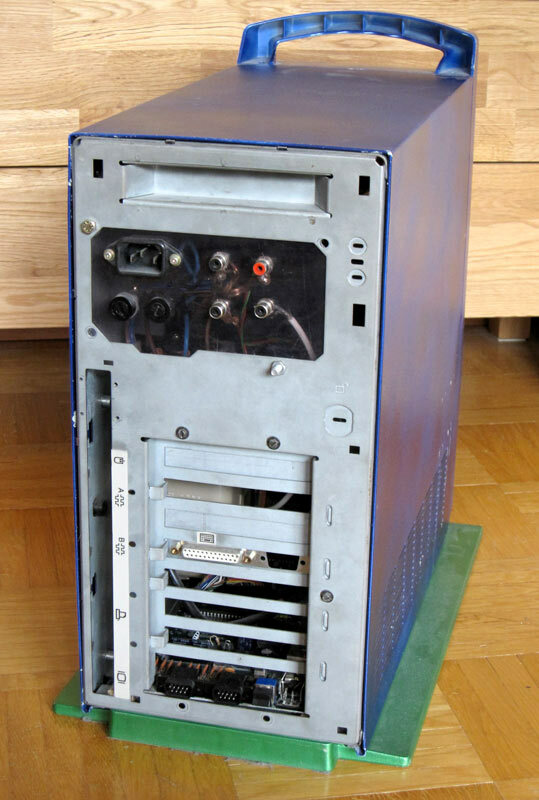 We were able to source the case cheap from another friend, but without PSU. We had only limited time to build the machine, so we went with the original power supplies. 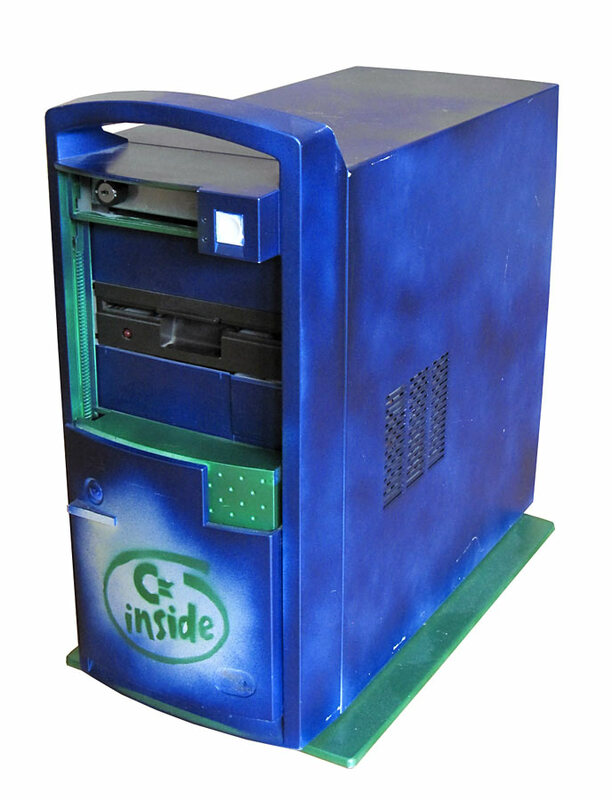 So there weren’t hardware modifications really, the speciality was the C64 and disk drive in a tower enclosure. For finishing touch we painted the case and installed a strobe light inside the case. At the time case modding wasn’t a mainstream thing – at least not here in Finland. As a result, our tower C64 caught some attention, with its special paintings hinting what’s inside, flashing strong light inside. The machine was also featured in MikroBitti’s official party report Awake. After the party the machine remained in my friend’s use for some years. At some point I got the machine back. 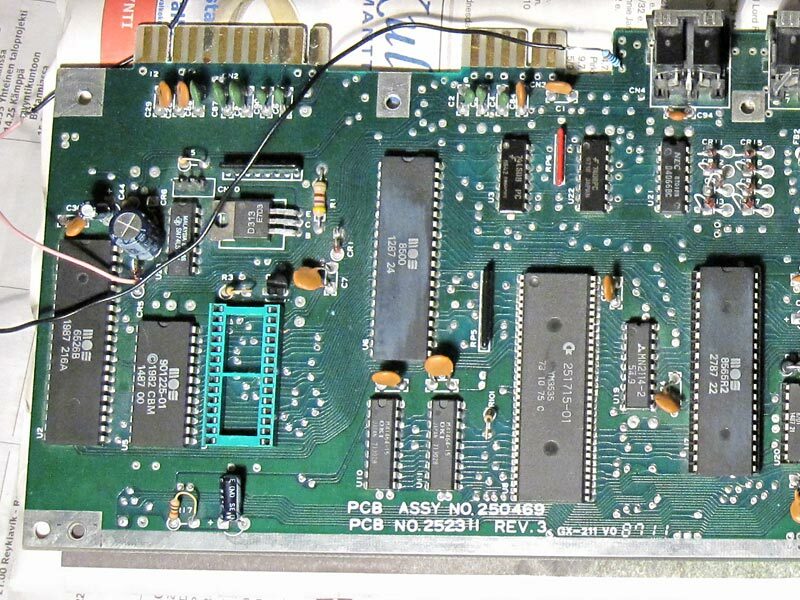 I remember it had issues with power supply at that point, thanks to some cheap solutions we did originally – the exposed power connector to C64 main board was busted. The machine ended up being stored away for many years. At some point I dug the machine out to start examine what its condition really was. 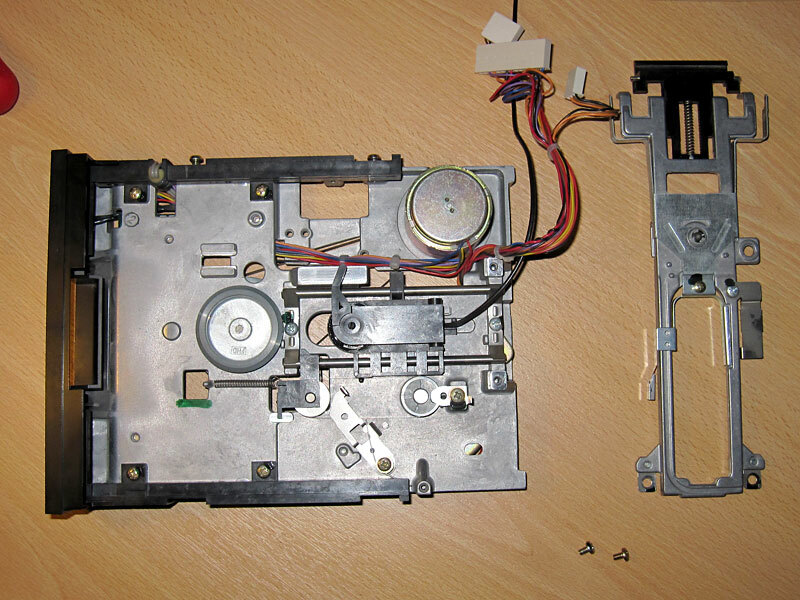 The first thing to do was to dismantle the machine so that I got the components out from the case. With the parts taken out I was able to test them separately using known good PSU in a safe set-up. I replaced the busted power connector of the C64’s motherboard with temporary wired-in DIN plug connector that is compatible with the C64 PSU. Now I could connect the motherboard like any ordinary C64 to any setup I wanted. After years of not being used the C64 booted up fine. The first startup took some extra seconds before the screen came up. After the first power-up the machine booted normally. I suspected that the electrolytic capacitors may have aged for not being in use for a long time, but luckily freshened up after powering them. In a less fortunate scenario some of the caps could have shorted destroying themselves and possibly some chips. Still I decided it’s better to replace the caps. The disk drive was also operating ok. Setting it up for testing wasn’t as easy thanks to the relocated transformer block. Just have a look at my test setup. Would make a cool installation! Luckily everything works like a charm! I didn’t plan to put everything back as they were, but to make some enhancements, stuff that we weren’t able to do back when we built the machine and also do some precautions and maintenance. Dismantling, cleaning and lubricating of the drive mechanics. This one is a Alps drive with pull-down lever. There was a lot of goo in the bearing. 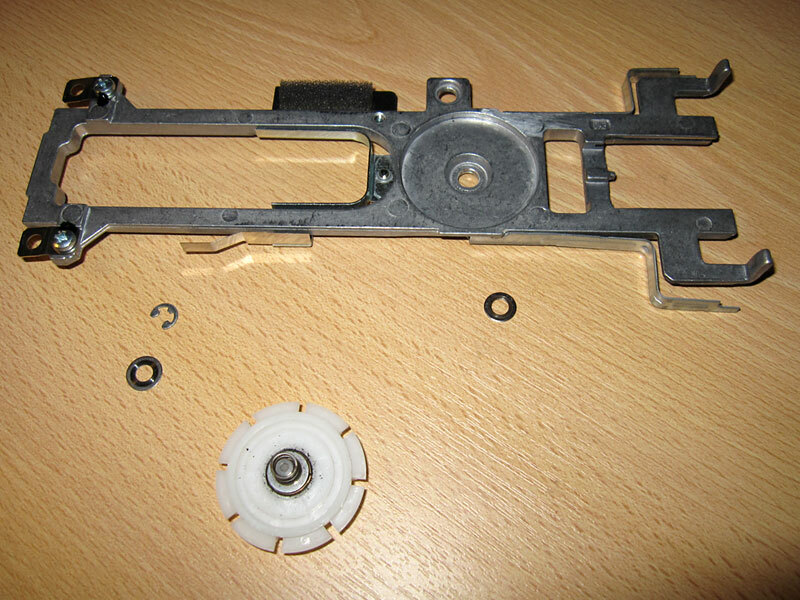 Cleaning and lubricating the parts with fresh oil loosened the drive upper spindle noticeably. 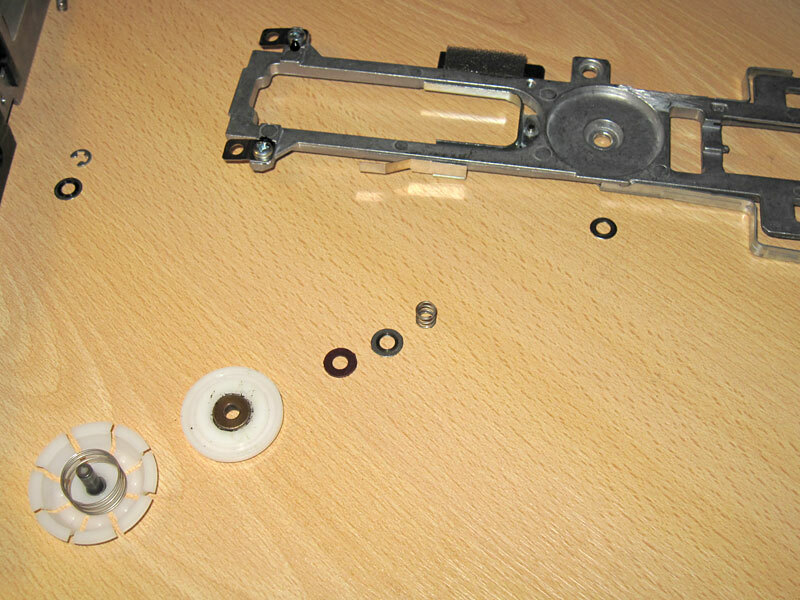 A word of advice: There are several small parts in the spindle assembly, including springs, washers and a lock ring. The lock ring was stiff as hell at least in this drive. Don’t loose it, don’t break it. When it comes off, the spindle assembly comes apart. Keep track of the order in which the parts were. Removing of the KERNAL + BASIC ROM and installing a socket for KERNAL update. This was the first time I desoldered a chip. 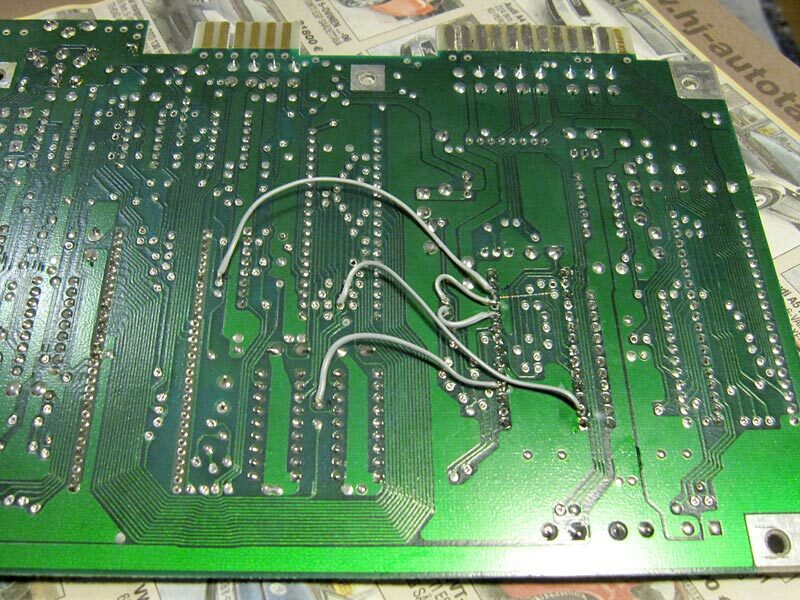 I first practiced by removing some chips from another, dead spare C64 motherboard. With that I was able to remove chips quite easily, it just took a lot of time and patience. This board gave me troubles though. For some reason I had severe difficulties getting the solder out from the holes with this one. I ended up breaking few traces which I then had to fix with jumper wires. I wired them below the board for aesthetical reasons. Here the motherboard is installed with JiffyDOS with a Flash memory based ROM. These are available from RETRO Innovations store. Replacing the capacitors is rather trivial and a precaution more than anything. More about this later on. I have more things planned, but everything rest is yet to be done. I will write more as I progress, stay tuned! This entry was posted on Sunday, January 8th, 2012 at 17:48 and is filed under C64 Hardware, Commodore 64, Projects. You can follow any responses to this entry through the RSS 2.0 feed. You can leave a response, or trackback from your own site. What a great project! I went the other way with an ITX board fitted inside my C64. Nice – how did you work out the keyboard input? I know Keyrah would be one resolution. Such an awesome design, I’m really miss my good old c64! Great build and with so much space in a case, there’s plenty of room for expansion. Do you plan to move datasette into 5.25 slot (I’ve seen it done somewhere IIRC) as well? I love how you ghetto modded power brick into the case. I hope you make a nice housing for the keyboard using a trimmed down C64 case (or something that resembles one).